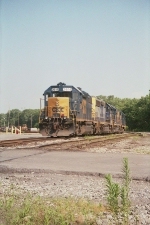 Description: CSX 2614 idles in Pavonia Yard awaiting its next assignment. 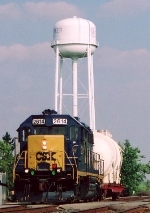 Description: CSX 2614 X-981 sports a fresh coat of paint and is leading a High and Wide load toward Indianapolis. Description: X-981 is a High and Wide special Westbound on the Indianapolis Line. Description: A short F741 is almost home with a nice GP duo up front. Description: CSX GP38-2 #2614 sits in the Diesel Shop at Hamlet, awaiting its next call to duty. Description: F768 departs Pinoca Yard with a solid EMD consist. The prefab turnout is one of many set to be installede for the large intermodal terminal expansion that is underway. 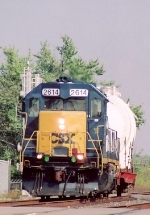 Description: HLCX 7843 (SD40-2) with some CSX help makes the final turn towards the yard.